Thanks everyone for your phenomenal response to the treemap that I posted for the 300,000 classifications post. It’s really neat to be able to see how different users have classified more, or less over time. Of course, if you are one of the top classifiers, it’s fun to see your name up there! At the suggestion of Lee Henderson, MD (wow! cool to see people from all professions and walks of life on Plankton Portal), I made an updated treemap with classifications from the past month. If there’s interest in periodic updates in this manner, let me know in the comments and I can post one of these up every couple weeks. But I don’t want to make it too much of a competition. Actually, it probably is a giant competition. So compete away! You might remember that we featured the top image in a previous Fantastic Finds Friday (FFF) post. Now we bring it back because of the other two images that were found (the last one found 1 hr ago). These images found three months apart might be the same organism but in neighboring frames. We can’t tell right away, but once we go back into the raw data, we will be able to pull out the locations and times of these three images to check. Now, the interesting question posed here is — is this siphonophore budding? 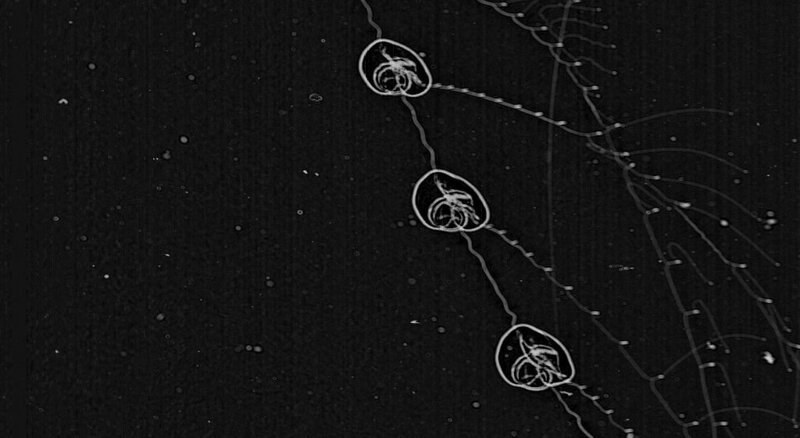 Are these siphonophores asexually reproducing as we imaged it? And the answer — yes! absolutely! (I addressed this question earlier in a Talk post but now’s the time to feature it in the blogs!) 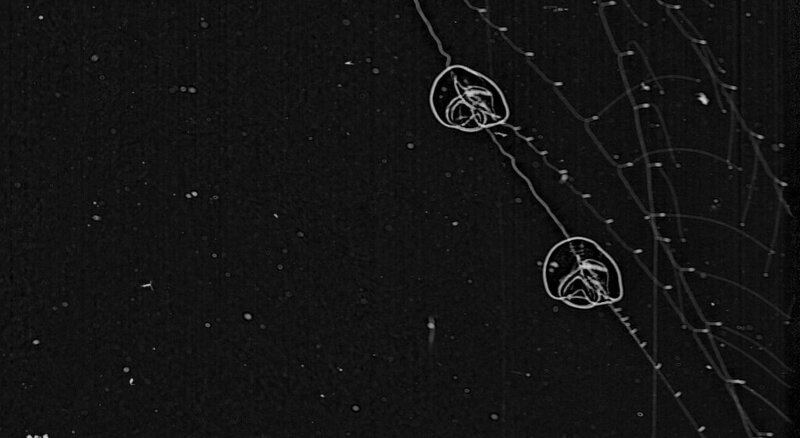 All the little round bells that you see on the tentacles are small siphonophores developing from the gonozooids (reproductive ‘organs’) that will eventually be released and form free-swimming “eudoxids.” When they are released, these eudoxids will develop and then be capable of sexual reproduction. Weird, right? But wait, there’s more. These eudoxids then develop little reproductive organs along its stem. Instead of eudoxids functionally male or female, they actually develop male and female reproductive parts – eggs and sperm – alternating between the two, sometimes regularly, sometimes irregularly. That way, they can ensure that the eggs are fertilized and can develop into larvae, then post-larvae, then adults. The open ocean is a vast place, and animals have developed vastly different strategies for how to ensure the continuation of their species, whether it is in spawning aggregations (e.g. Grouper fish spawning in the Caribbean – and larvaceans also apparently form spawning aggregations) or being hermaphroditic (like Ctenophores and some fish), and being able to asexually bud and reproduce sexually. 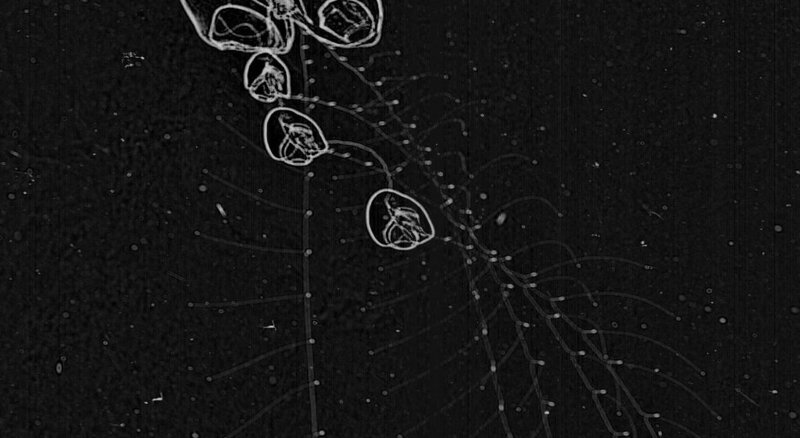 These siphonophores have adopted the strategy of being both hermaphroditic AND able to reproduce sexually and asexually. This is the best diagram I’ve found to describe the life history of a Calycophoran siphonophore (all of the ‘rocketship’ and ‘two-cup’ siphonophores). 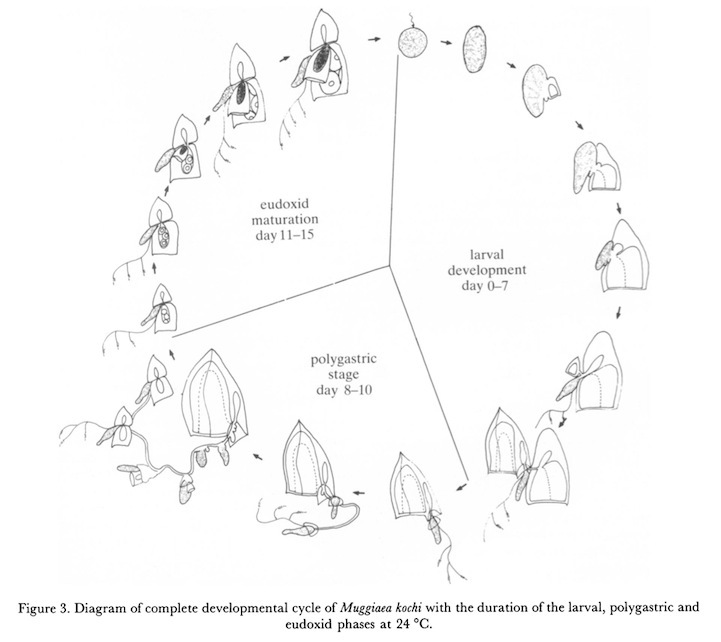 This one is from C. Carre and D. Carre (1991). This entry was posted in Citizen Science, Fantastic Finds, Plankton, Science and tagged asexual reproduction, budding, Citizen Science, classification, sexual reproduction, siphonophores, treemap by jessicaluo. Bookmark the permalink. Thanks for another interesting blog post. 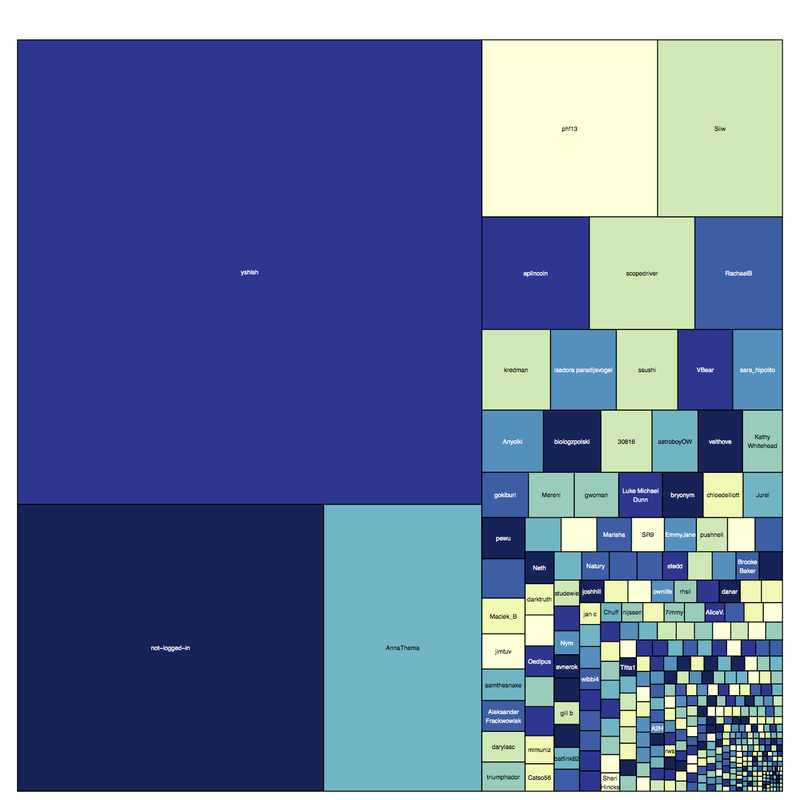 Both, the treemap and the reproduction issue, is such an exciting stuff. And I appreciate your quick response for my questions. You’re just awesome! Hahaha! Come, come….. I’m waiting for You, Tegan! Thank you for another interesting post! I can see how the tree maps can be interesting for many, and judging by the activity on the site yesterday, it definitely worked! It is really good to see more people using the comment system! Woo! Number two! Moving up in the world! I have to say, I’ve personally found classifying while listening to audiobooks to be the most relaxing thing ever. Seriously, you can do it for hours. Obviously I have. Lol, not as great an idea as that treemap. The first time you posted it, and I saw that I was ONE AWAY from the top twenty and squishy solmaris hugs, it really kicked me into overdrive. Now that I’m higher up, (I’m AnnaThema, in the unlikely event that was unclear) my main goal is to at least get halfway to Yshish level. The point being, I’ve found it to be a fantastic motivator, and I definitely vote for it’s continued usage. Is it also possible to see how many we have found of each kind? For example how many solmaris, how many larvaceans etc? and i’m curious how the data scientists get from our classifications look like. if there’s something like this table http://blog.snapshotserengeti.org/2012/12/14/we-need-an-i-dont-know-button/data1/ to every frame or..?